Today I needed a change of venue – something different from all the knitting/felting I’ve been doing. 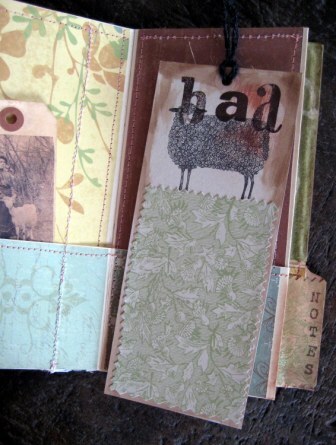 Something to help me get organized in 2011. To help rEmEMbEr all those on-line accounts and secret passwords! A few weeks ago I came across an article in cloth+paper+scissors Jan/Feb 2011 issue. 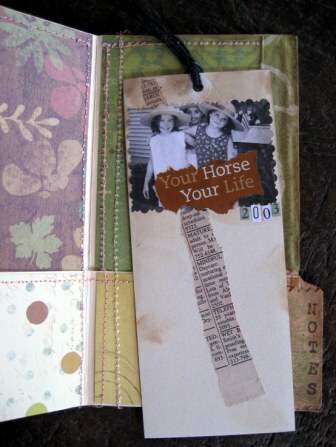 In case you’re not familiar with it, it’s a mixed media collage publication (They have a website as well.). An article ‘Folder Journal’ intrigued me. 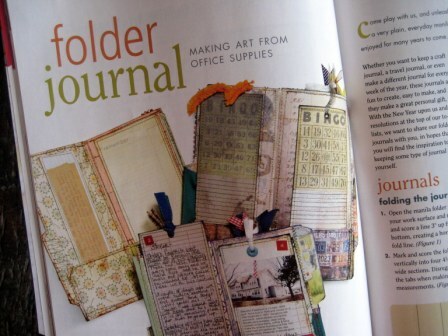 The article provided instruction on how-to create a journal from office supplies…that is, a simple manilla file folder! Hmmm…after studying the article, I thought to myself, I can do this! WARNING! Now, I’m not very talented with a sewing machine, nor am I a big-time scrapper, BUT, I have NEVER sewn on PAPER before. Ugh…the tension adjustment drove me cRaZY! So, now I almost have a handy ‘journal’ to organize my computer notes & secret passwords. The secret is in folding the file folder to create POCKETS for storing info. 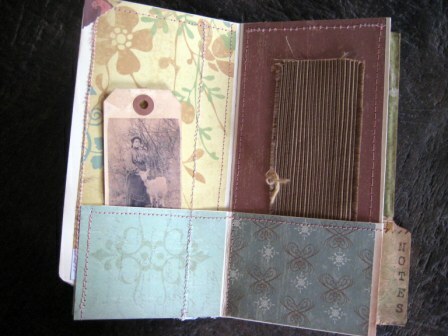 You create a mini book, stitched with the machine and covered/embellished with cloth, paper, emphemera, etc. 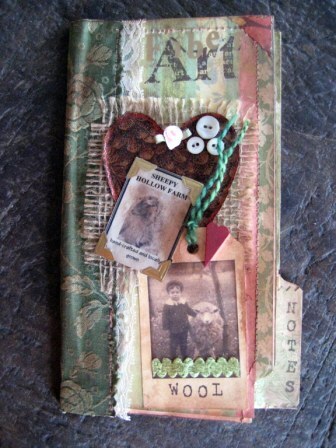 I’m liking it primitive and tattered, but you can embellish to your heart’s desire! This would be a fun project with the girlfriends and your kids…I think you wouldn’t have to necessarily sew it with the machine?!?? 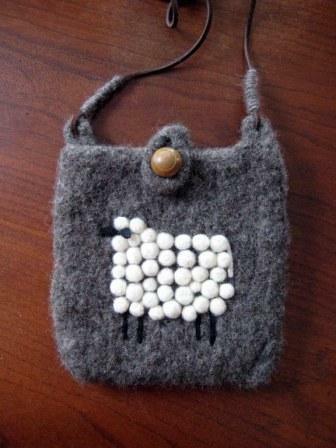 And, so you don’t think I’ve been sluffing, here’s my hand-spun Shetland felted bag with a sheepy on it. Look for it in my etsy shop!